In earlier blog posts, I wrote about the variety of Cameroonian food. 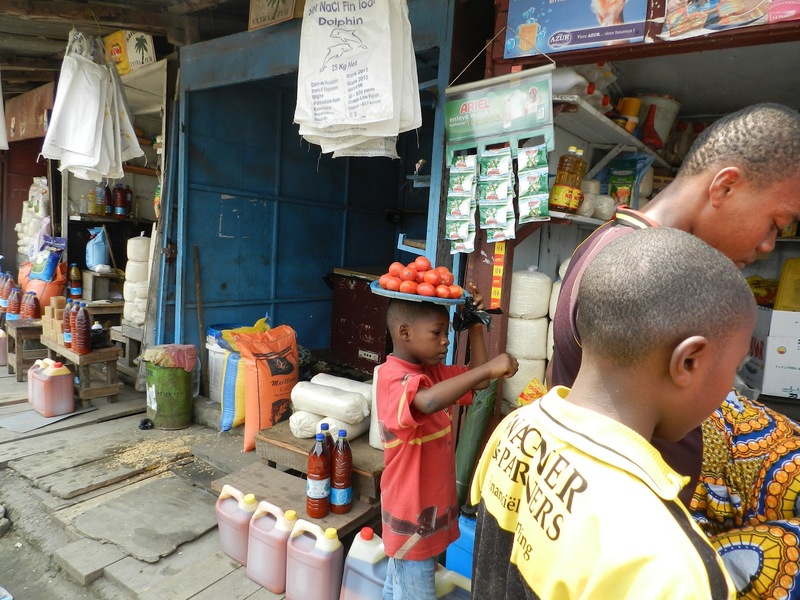 In this post, I'll delve into the daily life of the household in Douala, and the efforts put into getting a meal on the table. Douala is situated 4 degrees north of the equator, near the coast, at the estuary of the Wouri River. The climate is tropical. Humidity is extremely high and temperatures are most often in the 90-degree Fahrenheit range (30 Celsius). There is a rainy season that lasts about two months every year, when it gets slightly cooler (in 12 years I managed once to wear stockings, not really because I needed to), but humidity goes through the roof, and it can pour nonstop for several days in a row. In the first months, I used to go to the food market several times a week to buy groceries. Deido market was the closest (Deido is the Douala neighborhood where we lived, and my husband's ancestral home). It was not a very large market, but you could get everything you needed for regular household needs: meat, fish, tubers, fruit, condiments, etc. If it was raining, it was very muddy: if you didn't have lightweight rubber boots (rather hard to find), you wore flip-flops, which you could wash when you returned home. Flip-flops are called "no fear water" for good reason; the name for closed plastic shoes is "Dschang shoes," after the name of a town in West Cameroon. My mother-in-law accompanied me the first weeks so I could get the hang of it. She was able to carry home, balanced on her head, a whole cluster of plantain bananas ("régime de plantains"). I wish I had a photo of her carrying this load! The merchants sat or crouched at tables with the wares piled on them. If they were sellling flour, grains, powdered condiments... the measuring tool would be old metal cans of various sizes. Condiments such as fresh ginger root, which you couldn't pour, were sold by size. The only item that was weighed was meat. Even fish was sold by size, as only whole fish was sold; nobody had ever seen a filet, or even imagined a fish stick! Plastic bags were a scarcity too. We'd wash them several times to re-use them, and hang them to dry in the yard. The garbage pail had to be emptied every day, because of the heat and humidity. Planning meals was different from Europe and other "Western" countries, because you were never sure who might show up. One of the first advice I got was to never cook for a determined amount of people. Stews were the way to go as you cook serve them to a variable number of people. If you had the idea of cooking up 2 little steaks for yourself and your spouse, that would be the day 3 relatives would arrive, and try to cut up two steaks so 5 people can eat! This habit was due to the tradition, in the "old days" (pre-colonialism), to have a cabin available for travelers to stay in. The cabin would have a jug of water and a cluster of plantain bananas, so they could restore themselves before continuing their journey. The custom has remained alive to this day, insofar as a visitor is first offered a beverage (soda or an alcoholic beverage), and if it is meal time, food.